I tried out this recipe to explore the kinds of foods my Polish ancestors might have eaten, one of my cooking goals for this Vegetable and Fruit Year. I know that some people don’t like beets, and this recipe is not for them. Most of my beet recipes use sauces that play up the beets’ sweetness and play down their earthiness. 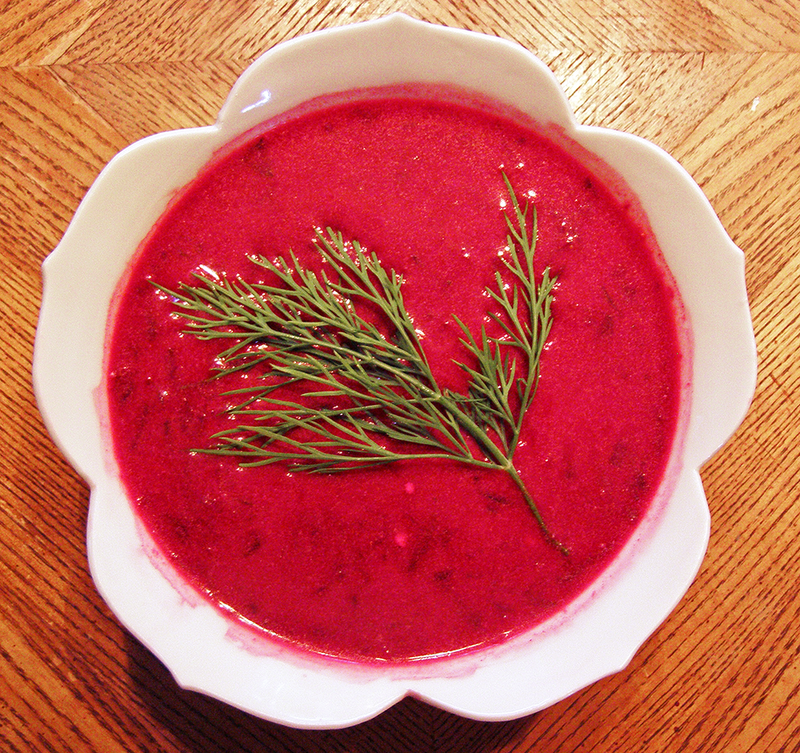 This recipe is all about beets, with a just little dill, tamari, and yogurt added. It’s unusual and summery, because it’s served at room temperature, although chilled or slightly warm work too. The beet greens add to the earthy taste. If you don’t like them, reduce the quantity or leave them out, reduce the liquid by ½ cup or so, and perhaps scale back the tamari. Tamari adds an earthy flavor of its own, balancing and modulating the beet taste, so don’t substitute that ingredient. I like using a super-thick yogurt to thicken up the soup. 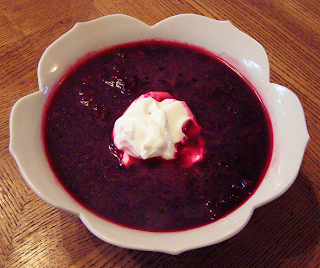 You can blend this beautiful red-purple soup with yogurt before serving, or let people mix in the quantity they like at the table, or do a little of each. The recommended proportion works out to ¼ cup yogurt to 1 cup of soup. Beet-eaters enjoy! Scrub and grate beets in a food processor or by hand. In a soup pot, combine the beets, broth, and tamari. Depending on the saltiness of the veggie broth and tamari, you might want to reduce tamari as low as 2 tbsp., or start with the 2 tbsp. and add more if needed after cooking. I did use all 3 tbsp., but my broth was not very salty. Bring to boil over moderately high heat. Cover and reduce heat to low and simmer 10 minutes. Add beet greens, dill, and scallion and simmer 5 minutes longer. Remove from heat and let cool to room temperature. Serve at room temperature or chilled. Just before serving, stir in the yogurt. Garnish with dill, if desired.